A family love for hockey combined with a passion for the Pilates Method recently led to a collaboration with my brother Justin Goldman, who happens to be the founder of The Goalie Guild www.thegoalieguild.com. Together we created "Off the Ice, Onto the Mat", a movement education program tailored just for hockey goalies. This group of athletes are prone to injuries, mostly within the hip joint, that come from repetitive movement patterns essential to their success as players. Justin and I feel strongly that by educating hockey players on body mechanics and alignment we can help them HELP THEMSELVES avoid injury. 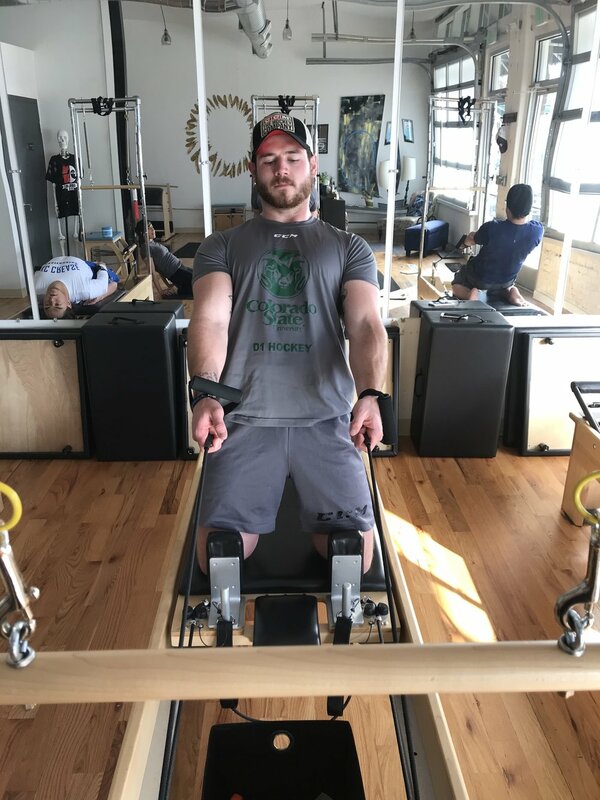 In addition, we continue to cull and compile exercises and practices from the Pilates Method that we feel will be useful for hockey athletes in their off the ice training regimens. Our "Off the Ice, Onto the Mat" sessions are hour long movement experiences created so that hockey goalies can practice doing moves that are NOT typical of their sport in order for them to experience TOTAL BODY AND JOINT HEALTH. It is our opinion that hockey goalies get plenty of great practice with very effective drills to hone their skills on the ice, but that they could have more support from movement educators (like myself) to help fine tune their understanding of their own personal strengths and limitations as it pertains to their movement needs. We want the goalie population, especially the younger players, to be have a movement practice that will help them support the health of their joints for years to come.